, an eminent Dutch divine, and the founder of a sect, if it may be so called, who were in opposition to the Cartesian philosophy, was born at Heusden, March 3, 1589, of an ancient and considerable family. 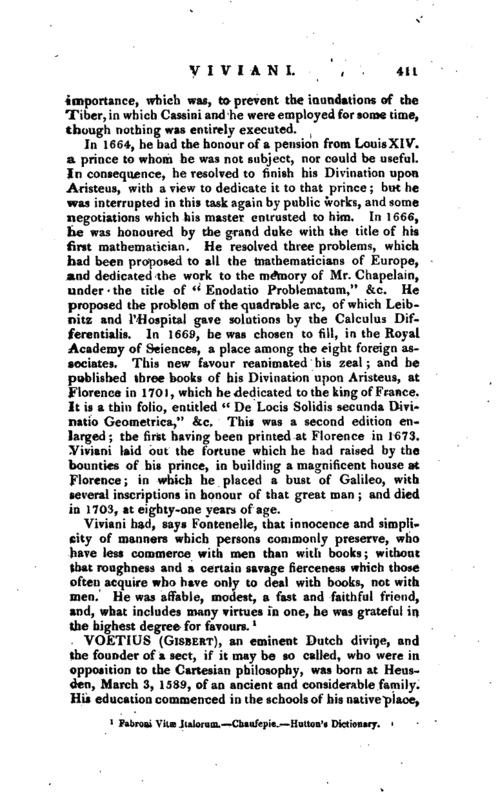 His education commenced in the schools of his native place, | and was greatly promoted by a memory of more than common retention, which he displayed to the astonishment of his teachers and friends, while he was learning Greek and Latin, rhetoric, arithmetic, and logic. It is said that he could repeat without book three entire comedies of Terence, as many of Plautus, the first book of Ovid’s Metamorphoses, the first book of Horace’s Odes, &c. and many other extensive parts of the authors he read. After finishing his classical course, he was sent in 1604 to Leyden, where he passed seven years, increasing his knowledge of the Greek language, but particularly employed on the study of the belles lettres, philosophy, and theology. In general science he had made such progress, as to be able to give lectures on logic, during his divinity course, and had among other pupils the celebrated Burgersdicius, afterwards professor of philosophy at Leyden. Voetius was also solicited to take the degree of doctor, but some particular reasons prevented him at this time. Having completed his academical studies in 1611, he returned to Heusden, and became a candidate for the ministry. He had also a design to have visited Germany, France, and England, but was long confined by an illness; and on his recovery was appointed to officiate in the church of Vlymen, a village between Heusden and Bois-le-Duc. He preached also occasionally at Engelen, about a league from Vlymen, and in both places with great ability and reputation, for about six years. In 1617 he accepted a call to Heusden, where he settled for seventeen years, although repeatedly invited to superior situations in Rotterdam and other parts of the United Provinces. In 1619, he assisted for six months at the synod of Dort, and during this time, along with three of his brethren, preached at Gouda against the Arminians or Remonstrants, to whom he was always a decided enemy, and was as zealous a friend to the doctrines of Calvin. While at Heusden, he preached occasionally at other places, and in 1629 to the army which besieged Bois-le-duc, and after the capture of that city he officiated there for about nine months alone with three other ministers. During his residence here, he and his brethren published a sort of manifesto, inviting all the inhabitants, and particularly the clergy, to a conference, either public or private, on the points in dispute between the reformed and the Romish church. Jansenius answered this manifesto in a work entitled ‘“Alexipharmacum civibus Sylvsc-ducensibus | propinatum ad versus mi nistrorum suorum fascinum,” Brussels, 1630, This produced a controversy, of whicu we have already given an account. 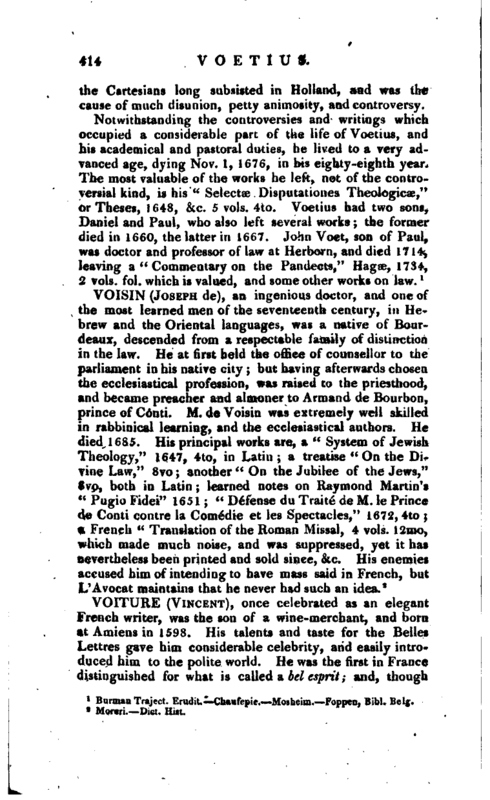 (See Jansen, p. 470——471). In 1634, Voetius was invited to Utrecht, where an intention was to found a school for divinity and the oriental languages, and he was at the same time appointed one of the ministers of the city. 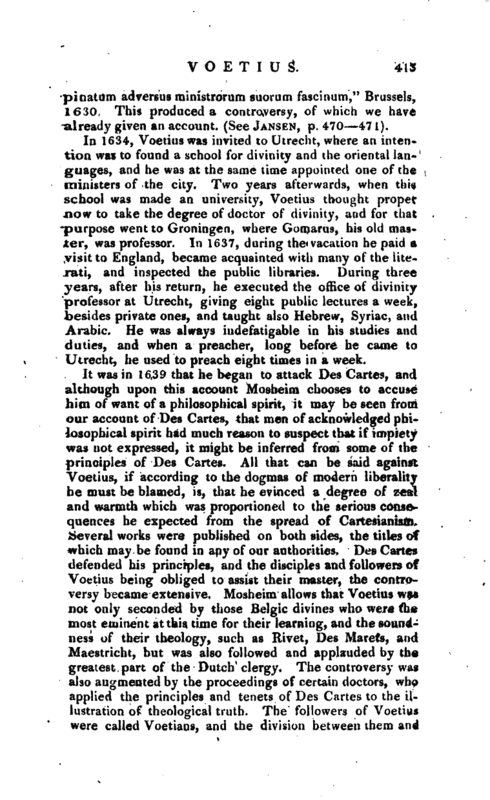 Two years afterwards, when this school was made an university, Voetius thought proper now to take the degree of doctor of divinity, and for that purpose went to Groningen, where Gomarus, his old master, was professor. In 1637, during the vacation he paid a visit to England, became acquainted with many of the literati, and inspected the public libraries. During three years, after his return, he executed the office of divinity professor at Utrecht, giving eight public lectures a week, besides private ones, and taught also Hebrew, Syriac, and Arabic. He was always indefatigable in his studies and duties, and when a preacher, long before he came to Utrecht, he used to preach eight times in a week. It was in 1639 that he began to attack Des Cartes, and although upon this account Mosheim chooses to accuse him of want of a philosophical spirit, it may be seen from our account of Des Cartes, that men of acknowledged philosophical spirit had much reason to suspect that if impiety was not expressed, it might be inferred from some of the principles of Des Cartes. All that can be said against Voetius, if according to the dogmas of modern liberality he must be blamed, is, that he evinced a degree of zeal and warmth which was proportioned to the serious conse^­quences he expected from the spread of Cartesianisrn. Several works were published on both sides, the titles of which may be found in any of our authorities. Des Cartes defended his principles, and the disciples and followers of Voetius being obliged to assist their master, the controversy became extensive. 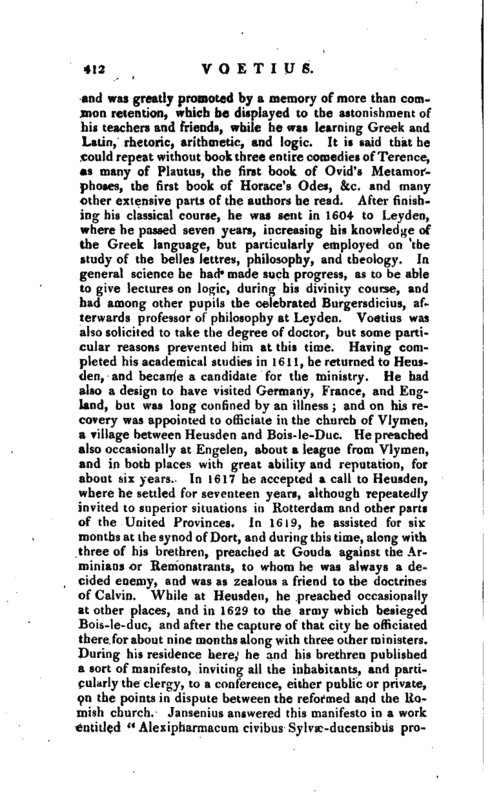 Mosheim allows that Voetius was not only seconded by those Belgic divines who were the most eminent at this time for their learning, and the soundness of their theology, such as Rivet, Des Marets, and Maestricht, but was also followed and applauded by th greatest part of the Dutch clergy. The controversy was also augmented by the proceedings of certain doctors, who applied the principles and tenets of Des Cartes to the illustration of theological truth. The followers of Voetius were called Vyetians, and the division between them and | the Cartesians long subsisted in Holland, and was the cause of much tlisnnion, petty animosity, and controversy. Bui-man Traject. Erudit. —Chaufepie. Mojheim. —Foppen, Bibl. Beljj.